FOR HIGH WIND ZONES ONLY! BLADES AND A POWERFUL SUPERCORE PMA! 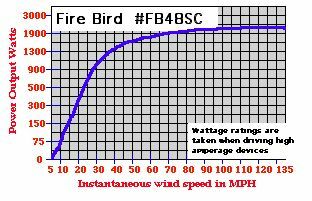 during full-force-winds as the wind speed chart shows. Our toughest and most powerful wind turbines in higher wind zones! are surprisingly quiet and non-offensive to be around. Very neighbor friendly. Available in 12 volt only! WIND POWER! Because The Sun Doesn't Shine At Night. charging for home power systems. Hornets offer the most wind power for the least money! Rain, ice and storm proof electronics. PMA has no brushes, very dependable! True PMA for efficient power generation. Comes with six carbon fiber composite blades. Fits on 1.5" Schedule #40 or #80 pipe. Includes mounts and locks. Each Hornet comes with one six side hub. Makes 59" diameter turbine. Weighs 26 lbs. / Ships UPS in One 9" X 7" X 37" Box. D.C. output with negative ground (To find optimized amps - "watts " ÷ "volts" = "amps") The Wattage ratings on the chart above are valid when turbine is connected to a battery bank within optimized voltage levels and drawing peak amperages. Connecting this turbine to lower voltage battery banks to achieve better low wind speed charging may diminish total power output during high wind speed events. Designed for 12 volt high amperage battery charging. (With Dual Tail) with the new "MEAN GREEN" blades. this grid Inverter. 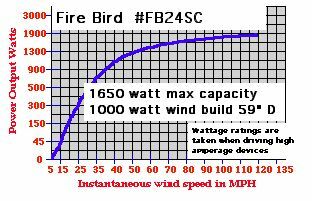 One wind turbine and one grid feeder is NOT a smart idea! Think "Mini Wind Farm" here and then you are on the right track! nice grid feeding unit for you to buy. data before buying a Grid feeding inverter from them. RUN YOUR POWER METER BACKWARDS! means that in a fairly windy area you could have a full return on your investment in under 2 or 3 years! After that,,, FREE power for the rest of your life! NEED MORE POWER? - Install A Mini Wind Farm! More total power per dollar spent. Easy self installation. No cranes or heavy equipment needed. Progressive affordability. Start small and add more turbines as you can afford them. Redundant dependability with multiple turbines running. Very winter proof! Snow and ice create no major problems for small wind turbines. No high wind speed worries. 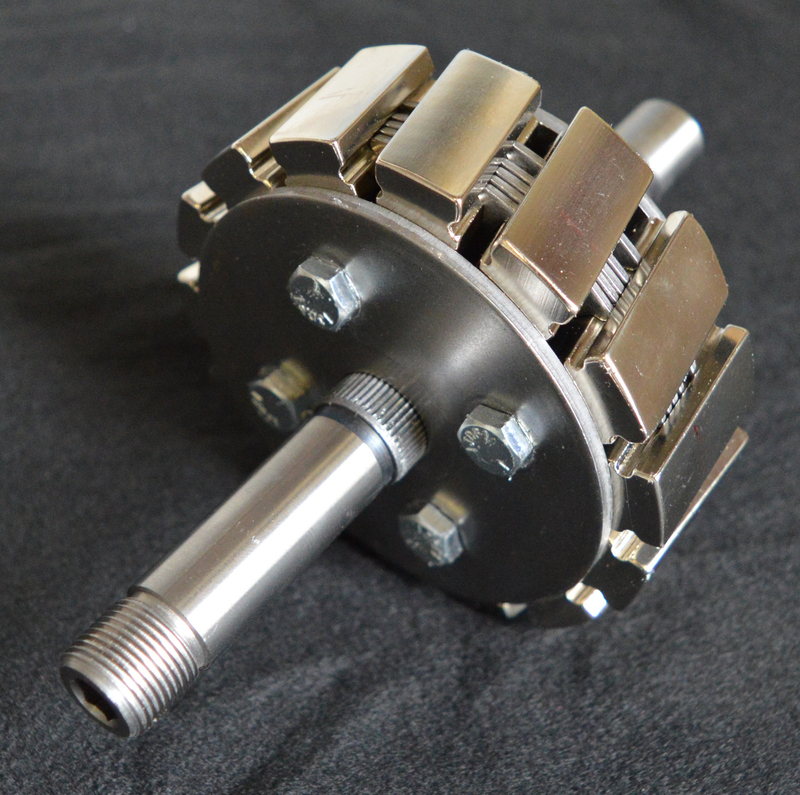 Small turbines are extremely durable in storms! 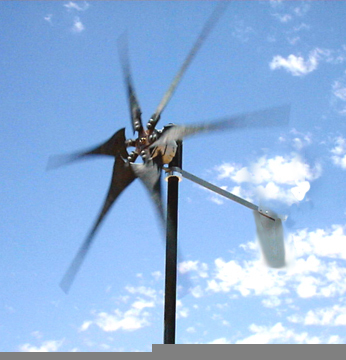 No building permits required in many areas for low level turbines mounted under 28 feet high. Flexibly. Add ONLY as many turbines as you need to run your household. Less conspicuous than a giant 80 foot tall tower requiring a giant 160 foot radial fall zone. No expensive towers to buy that can actually cost more than the wind turbine itself!!!!!!!!!! Mini wind farms blend in with PCenery and have a high acceptance rate from neighbors and community. makes sense to put up a mini wind farm instead of one large wind turbine. 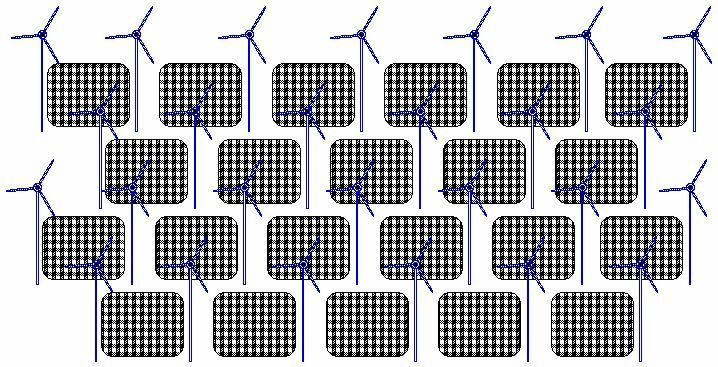 It puzzles us to see people putting in 10 solar panels and ONLY one wind turbine and then wondering why the wind turbine puts out less power than their 10 solar panels. If you put in 10 Hornet wind generators and ONLY one solar panel then you would be wondering why the solar panel puts out less power. We need to re-educate the public into realizing that having multiple wind turbines are not only a practical solution but an absolute necessity for creating low cost electrical energy. The inherent miPConception of having only ONE wind turbine per property is a myth that has to be actively talked about and challenged. There are plenty of areas with good wind near or close to ground level. There is much talk of having very tall towers in the wind turbine industry but NOT every area requires this type of strategy. At our facility for instance, it's difficult to remain standing on very windy days. If you can feel a strong breeze while walking on your property you are in a perfect spot for a low level mini wind farm. 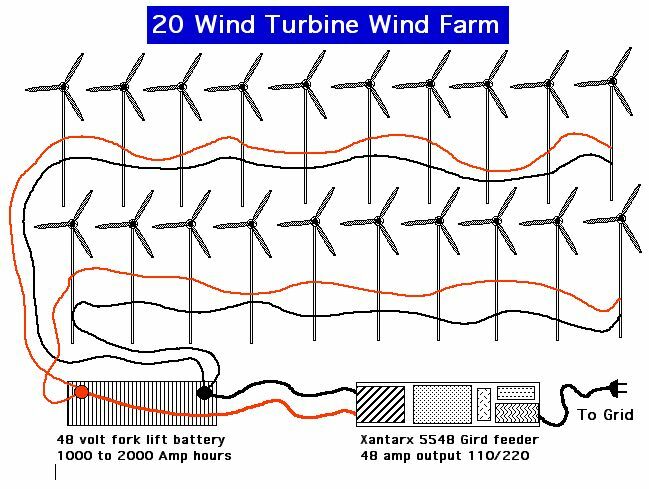 There are millions of sites all over the world that have good low level wind characteristics just perfect for mini wind farms. 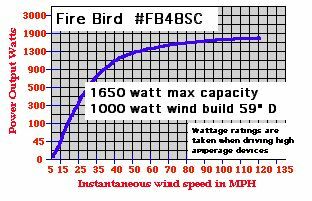 No Bird Strike with mini turbines - Mini wind turbine farms are mounted low to ground and a birds brain is "Hard Wired" to fly very evasively when gliding near ground level. Studies show that when birds fly at 30 feet or lower they become much more alert! They fear running into tree branches, vines, brushes, predators and all the other hazards that near ground level flight presents. For these reason birds and even bats successfully avoid contact with the whirling blades of LOW LEVEL MOUNTED mini wind turbines. 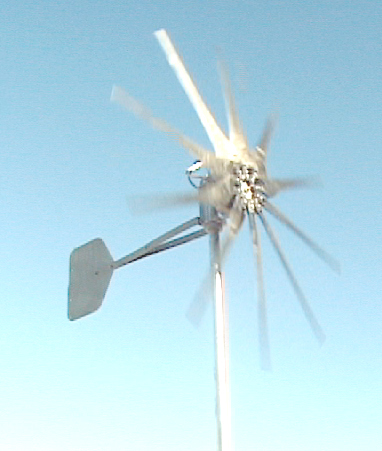 Also the slight "Whooshing" sound that the mini wind turbine emits is enough to keep birds at a safe distance. 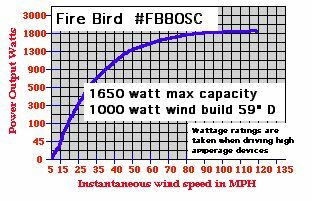 Most recorded bird strikes occur at the larger industrial sized wind turbine farms and for good reason. Birds relax when flying high about the tree line and do not expect to get WHACKED by a fast moving propeller when flying 200 feet above ground level. Those blades are very high, silent and moving at over 70 MPH... WHACK!!! ALSO READ BATTERY TALES BELOW!!! Get a fork lift battery! Try calling places that sell used fork lifts. The 12 volt batteries that run fork lifts are the best! Many of these old batteries are diPCarded because they can no longer operate a fork lift for a full 8 hour work day but they still have enough operational life to run your household for many decades. Many can be bought at recycling prices and still have 100 times more amperage than a brand new bank of automotive type batteries that will only last for 2 or 3 years.